Bluefish get their name from their color. The fish are a greenish blue with silvery sides and a white belly. Bluefish have a pointed snout and large mouth. The lower jaw of a bluefish sticks out past the upper jaw. Bluefish have a sturdy compressed body, a large head, and pointed, razor sharp triangular teeth. Note the black blotch at base of pectoral fin. Bluefish are found throughout the world and are a migratory species that range from Nova Scotia to Florida off the Atlantic coast and can be found in the Gulf of Mexico from Florida to Texas. Along the east coast, bluefish migrate northward in the spring and summer and southward in the fall and winter. Bluefish can live to be 12 years old and can reach 40 inches in length. There are bluefish in all the world's oceans. Most juvenile bluefish spawned in the south during the summer in the mid-Atlantic and in the fall spring in the South Atlantic remain in the coastal waters, but some summer-spawned fish do enter the lower Bay for a couple of months before they return to the coast in the fall and join the adults in their move southward. Most bluefish mature by age 2 (approximately 14½ inches), and females can produce from 900,000 to 4,500,000 eggs. Spawning and larval development takes place offshore in the South Atlantic (North Carolina to Florida) in the spring and to a lesser extent in the summer and fall, and in the mid-Atlantic during the summer. In Maryland, peak spawning occurs offshore in July. After they spawn, bluefish move inshore with smaller fish generally entering Chesapeake and Delaware Bay and larger ones moving northward. Juvenile bluefish grow quickly and by late fall, there are usually two size groups along the mid-Atlantic and New England coasts. Those fish that were spawned in the south during the spring are 6-8 inches, whereas those spawned in the summer are 2-4 inches. Peak abundance of bluefish near the mouth of Chesapeake Bay occurs in April-July and again in October-November. Bluefish are well known to anglers as an incredible fighter with tremendous biting power. They are a highly prized fish and the most sought-after species among recreational fishermen during May through October in Chesapeake Bay. In the Bay, fishermen catch bluefish by trolling, or casting artificial lures. 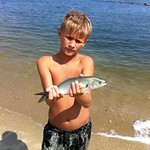 Cut baits are good for catching bluefish. On the beaches near Ocean City, people surf fish for bluefish in the fall. Approximately 90% of the bluefish harvested in Maryland are caught by sport fishermen. Commercially, most Bluefish harvested in the bay are caught in pound nets, while those harvested on the coast are caught in trawls and gill nets. Bluefish are a pelagic schooling species that primarily travel in groups of like-sized fish. Adult fish migrate like birds, traveling north in the spring and south in the fall and winter. Known as the "marine piranha" because of its aggressive feeding habits. Bluefish have been known to strike at anything. Bluefish are so voracious they will even kill prey they do not eat and have occasionally bitten human swimmers who were unfortunate enough to encounter a feeding school. ​For information concerning bluefish and their management, please contact Eric Durell.